Collaboration between Girl Scouts and Nestle? Nestle Crunch Thin Mints Edition?? There's a wild internet rumor going around that Nestle Crunch has collaborated with the Girl Scouts of America to create a line of Girl Scout Cookie inspired Nestle Crunch bars. 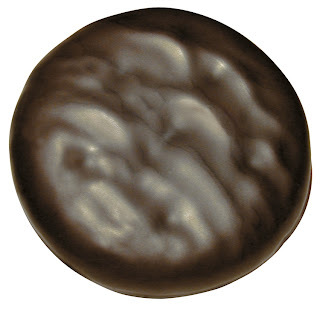 Jezebel blog published an image earlier today of an actual Thin Mints Crunch Bar and it looks totally entrancing! The only question is how to get my hands on one of these. Any reader that spies them for sale, please let me know! 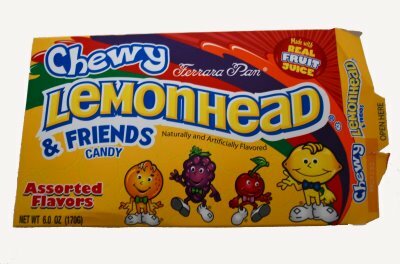 Grapeheads (Alexander the Grape, in the old days), Lemonheads, Orangeheads, Cherryheads all count as fantastic classic candy. Their sparkling flavors and perfect consistency make them deserve their spot in the candy pantheon. These Tropical Chewy Lemonheads & Friends, however, are so disappointing. I'm already on the fence about Chewy versus Classic Lemonheads & Friends. These are chewy in an assortment of murky artificial flavors- Kiwi Strawberry, Peach Mango, Berry Banana, Cherry Watermelon, and Lemonade mixed with Pink Lemonade. I didn't like a single one. Ok, the Lemonade/Pink Lemonade was pretty tasty but that doesn't really count as a flavor combination. 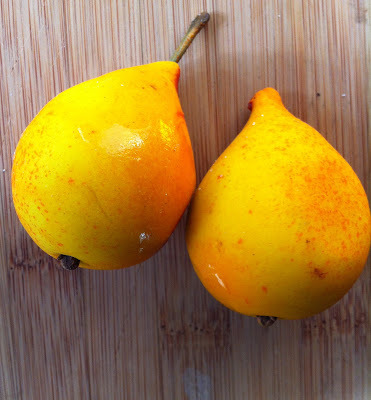 Instead of these, buy yourself some Cherryheads. Thanks to my Mom, this Valentine's Day I was the lucky recipient of a one-pound box of fudge in a variety of 16 flavors from Sweet Surrender based in Atlanta, Georgia. This is compellingly good fudge- super rich and dense and melty. Some flavors work better than others. The basic chocolate, peanut butter, maple, and mint are some of the best I've ever tasted. Some of the fruitier flavors are little too sweet to me, favoring the orange or key lime pie flavor over the basic fudge base. I think fudge always should remain grounded in its basic fudge flavor with sub-layers of flavor added in. Some of these flavors are a little too strident. That hasn't stopped us from compulsively consuming half the box within three days. You can order your own variety of sweet fudge flavors online from http://sweetsurrenderfudge.com/. Thanks, Mom! Healthy Snacking? 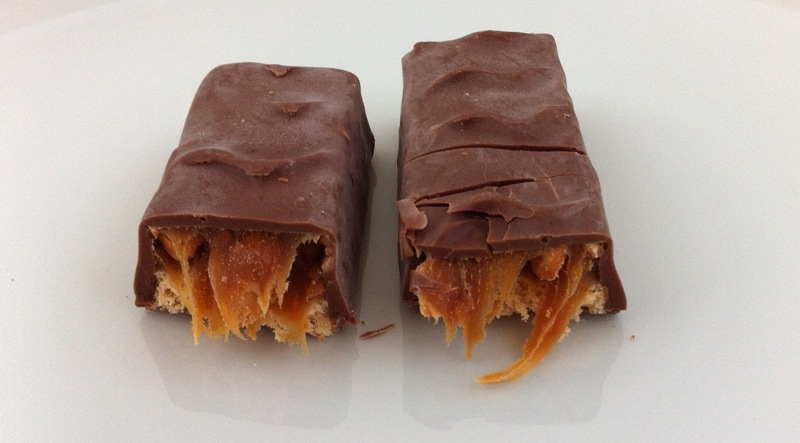 Snickers to Downsize Portion in 2013. The Salt, NPR's Food Blog has announced that beginning in 2013, Mars will make all of their candy bars in portions under 250 calories in order to support "responsible snacking". No more King Size, and chocolate bars like Snickers will be reduced in size (by about 11%) in order to maintain its calorie-conscious stance. Other Mars- generated candies such as Twix and M&M's will remain unchanged because they already weigh in under the requisite 250 calories. Personally, I'm fine with indulging in a little less. And anyone who really misses the massive King Size bar can always consume two Snickers instead. I just wonder whether these new portions will make any real difference in the (empty) calories people consume- they're already picking up a Snicker's chocolate bar instead of yogurt or other healthy fare. But portion control, rather than abdicating chocolate treats altogether, does seem like a more reasonable expectation for people trying to lead more calorie-conscious and healthy lifestyles. Read more at The Salt. 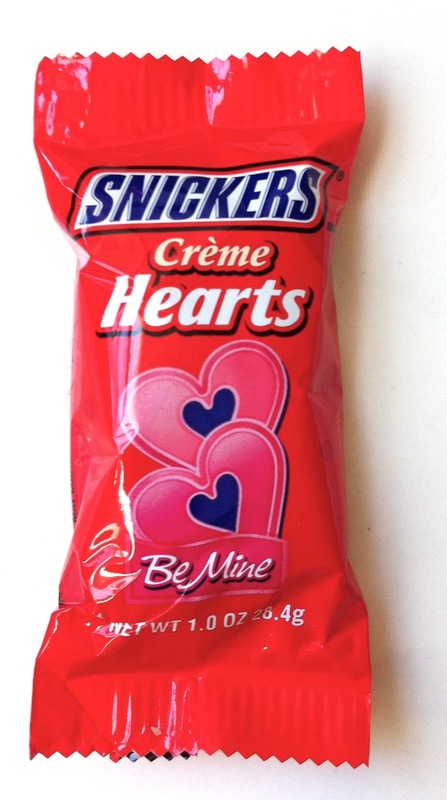 I think my expectations ran a little too high with the Snickers Creme Hearts for Valentine's Day. 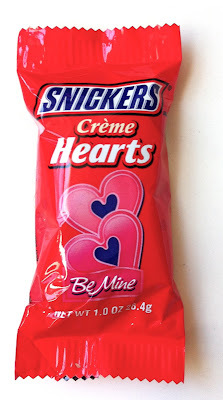 By "creme," I thought the packaging meant that I would bite into some fluffy creamy distillation flavored with the all the elements of a Snickers bar- some chocolate-y, nougate-y, caramel-y, peanut-y blended filling that would equal the sum of all Snickers essential parts. I think I just read too deeply into the description. 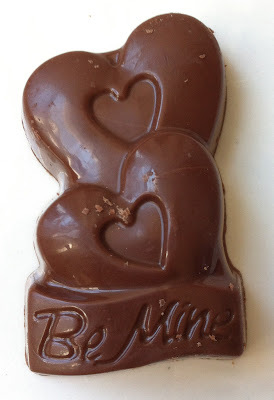 These are mini-Snickers bars in festive shapes for Valentine's Day. They're delicious, no denying, but don't bring anything new to the table flavor-wise. I'd still eat them by the handful. Thanks, Dan, for finding these! Hmm, I tried Cherry Cordial m&m's awhile back (read review here) and I honestly don't remember the flavor well enough to discern whether they are any different from these new Cherry m&m's. Either way, I don't like these very much. The Cherry flavor tastes really artificial, like the flavoring of cough suppressant or dentist's flouride, more chemical than fruit. The shells painted in shades of red for Valentine's Day are festive, and I like that these come in a little larger size than your standard m&m's, but I definitely wouldn't purchase more of them. 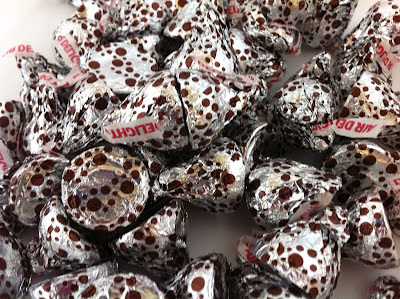 Oh my, besides the caramel-filled Hershey's Kisses, these Cherry Cordial Creme Kisses are the best flavor yet! They're a lot like Brach's original Cherry Cordials but without the actual cherry in the middle. It's just Hershey's chocolate overflowing with liquid-y cherry vanilla flavor. 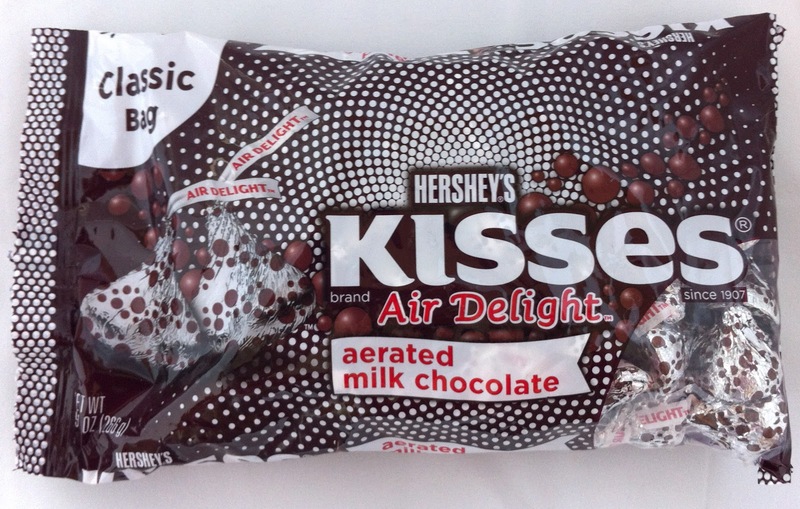 With so much liquid contained within each delicate Kiss, it's amazing that not a single one leaked within the entire bag. Magic! 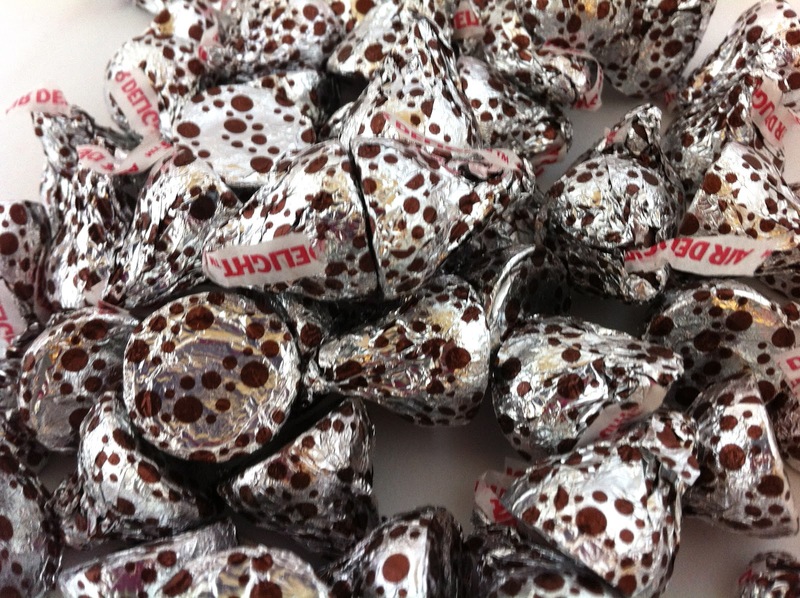 If you like Cherry Cordials, run and stock up on these delightful Kisses! Wonderful! Thanks, Dan! CBS News has just announced the sad passing of 93-year-old Nello Ferrara, Chairman of the Chicago-based Ferrara Pan Candy Company. Nello's father started the family company back in 1908, and over the years Nello was responsible for the invention of beloved classics such as Atomic Fireballs, Lemonheads, and Red Hots. 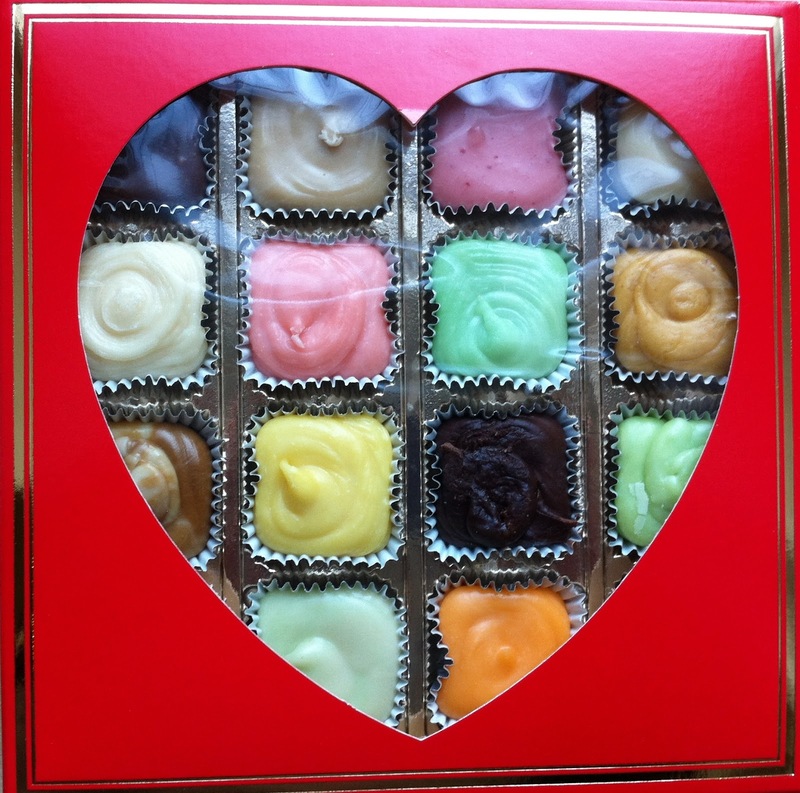 Head over to Gothamist and CBS News for more on Nello's candy achievements. 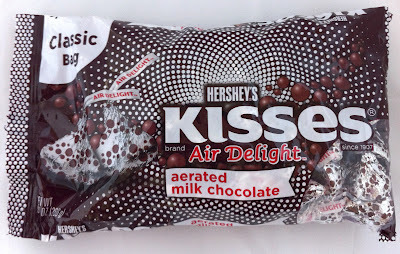 I reviewed Hershey's Air Delight chocolate bar in a previous entry (read here), and the Kisses aren't that different. That said, I don't like them quite as much. 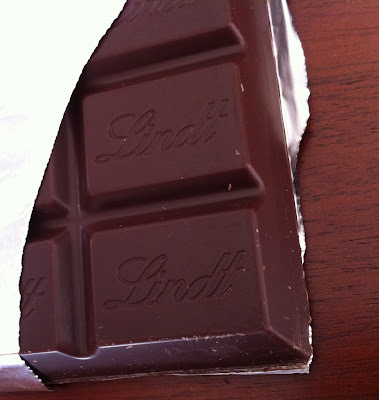 The ratio of solid chocolate to aerated chocolate is heavier on the aerated side in the Kisses, whereas the thick chocolate coating of the candy bar offered a more cohesive balance. These are tasty, but at base Air Delights are more about the absence of chocolate, and what's the fun in that? Thanks for finding these, Dan! A brief comment about candy at work. My office is filled with people who appreciate and share sweets, and I appreciate that I am surrounded by like-minded individuals. I noticed very quickly upon starting my new position that people placed candy out for sharing on pretty much a daily basis. This fact alone didn't surprise me. What did surprise me is that the candy disappears around here really quickly. At first I felt guilty dipping repeatedly into the never-ending candy bowl, but then realized that I often didn't even reach the bowl in time for seconds. And I like that. There's no shame in indulging when everyone is. 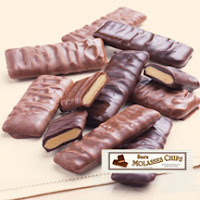 Recently one of my co-workers returned from a trip to California with See's Candies Molasses Chips in hand. The entire box disappeared in record time, and the reason why is obvious. These are amazing and really unique. See's chocolate is really lovely- melty and rich, kind of like a hand-made higher quality Cadbury. The molasses brittle is crunchy, like a toffee infused with molasses, which combines beautifully with the chocolate. Each "chip" is the perfect two-bite size. I can't stop thinking about them and other co-workers have mentioned the same. Why doesn't See's distribute on the East Coast? Thanks, Liz! Lindt chocolate in every variety feels especially decadent. It is so rich and creamy and this bittersweet chocolate bar is no exception. It has that wonderful bittersweet bite but balances with the sweet just enough to offer a really compelling flavor. What makes it even better? This candy bar is HUGE. I have provided a photo including a quarter for scale. The packaging is also so luxurious, with the chocolate wrapped in a crisp metallic gold wrapper on the outside along with a silver metallic wrapper on the inside and that makes me feel like I've found Willie Wonka's winning ticket. Thanks to Will and Ben for bringing me this magnificent treat! Smirk chocolate bars are the dairy kosher version of Snicker's. They're produced by Paskesz Kosher Company, a near-century old Kosher candy maker and distributor that originated in Hungary and has operated in Brooklyn for the last half-century. I'm confused but thrilled to have found this Smirk bar because, as reported in a post this past March, Pasketsz supposedly went out of business. A real loss. Anyway, I was lucky to discover this Smirk bar out in Brighton Beach, Brooklyn. It's a Snicker's bar with tiny variations on the basic components. The chocolate isn't as melty or milky. The caramel is thicker and constitutes a little larger proportion of the bar than in Snicker's. The nougat is a bit stiffer. I liked it. 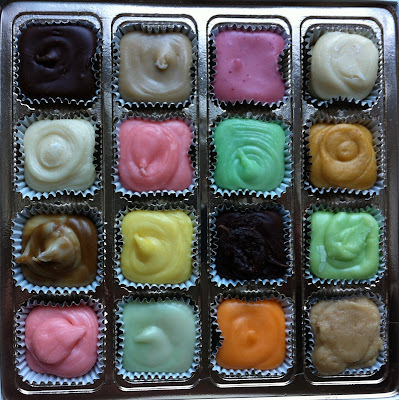 I keep posting images of the marzipan from Fortunato Brothers Bakery in Brooklyn because I think that it is some of the most beautiful marzipan I've ever run across. Even more important, it is some of the finest tasting marzipan I've ever sampled. 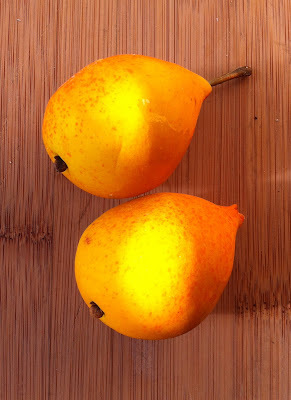 These perfect pears were so realistic in appearance it's almost disarming to discover the marzipan flavor and texture. They're nearly too wonderful to consume! Thanks, Bernice and Abe!